This week I’m bored with sweet pies. Fruit too. I searched through a bunch of recipes this weekend and came upon this one from aaron cindi at allrecipes.com. The crust is a basic crust from the cookbook 500 Pies and Tarts. This pie clocks in at a whopping 858 calories per serving so let’s be careful people! Combine the flour and salt into a large mixing bowl. Cut the shortening and butter into small chunks and blend into flour mixture using a pastry blender or 2 knives in a criss-cross motion. Blend until mixture has texture of coarse sand with a few small pea size balls of butter and shortening. In a separate bowl, whisk the egg, vinegar and water. Slowly pour into flour mixture and stir only until moist. The dough should stick together and hold the form of a ball. Divide the dough into 2 balls and wrap in plastic wrap. Flatten each into a disk and put in fridge a minimum of 30 minutes. 1. Heat canola oil in a large saucepan, and cook the kielbasa sausage and chicken meat over medium heat until the sausage has browned, about 10 minutes. Sprinkle the meat with 1 tablespoon of Cajun seasoning and 1 tablespoon of blackened seasoning as it cooks. Remove the sausage and chicken from the pan, and set aside. Cook the onion, celery, and green bell pepper in the hot oil until the onion has turned translucent, about 5 minutes, sprinkling with 1 more tablespoon of Cajun seasoning and 1 tablespoon of blackened seasoning. Remove the vegetables with a slotted spoon, and set aside. 2. Make a roux (I’m still not sure what this is, even though I made it) with the oil left in the pan by sprinkling it with the flour. Whisk the flour and oil together, and cook over low heat, whisking constantly, until the mixture is a pale brown color. This could take up to 15 minutes; watch carefully so the roux doesn’t burn. Slowly whisk in the chicken broth, about 1/2 cup at a time, to make a thin, smooth gravy. Bring the gravy to a simmer, mix in the cooked sausage, chicken, and vegetables, and cook until slightly thickened, about 20 minutes, stirring occasionally. 3. Mix the rice into the gravy mixture, and simmer until the rice is almost tender, about 15 minutes; mix in the shrimp and cook until they are opaque and pink, 5 to 10 minutes. Season the filling with black pepper and cayenne pepper remove the filling from the heat. 4. 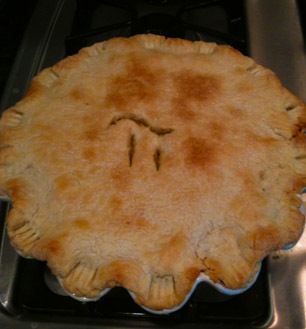 Fit a pie crust into 1 9-inch pie dish; brush crust with beaten egg, and poke holes all over the crust with a fork. You can also use pie weights, which I finally bought! Bake in the preheated oven for 3 minutes. Fill the parbaked crust with the jambalaya filling, top with the second crust, and pinch and crimp the edges of the crust together with a fork. Brush the crust with more beaten egg, and cut several steam slits into the top of the crust. 5. Bake in the preheated oven until the crust edges begin to brown, 10 to 15 minutes. Line the edges of the crust with foil, and bake until the whole crust is golden brown, about 5 more minutes. I have never made jambalaya before so I’m thrilled about it. To put it in a pie is certainly unique but I don’t think it’s totally necessary:) The whole thing put together does taste really nice though. The kids and their friends, who ate over before their big out-of-state move , did really like it. So this one’s a winner. Thanks Cindi!